Patrick 'Ditch' Cassidy was the soulful lead singer of The Shadracks (1965) and the King Bees (1965-1967). He fronted several outfits, most of them short-lived. He also did a 6 months sting fronting Some People (at a guess this was probably in late 1967 or early 1968) and briefly replaced Sam Mahood in the Soul Foundation. 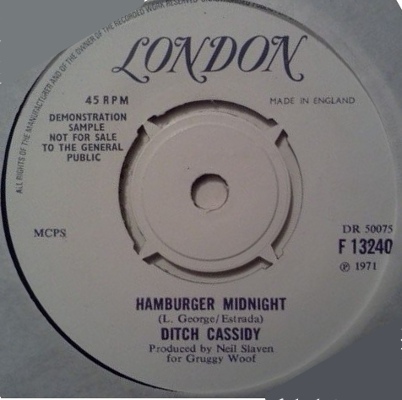 In 1968, fresh from the King Bees second stint in Germany, he formed Ditch Cassidy & The News. The News had a fluid lineup but at one point it contained most of The Creatures: Frank Boylan (bass), Ray McDonald (drums) and later Brian Harris (guitar), though Ray McDonald may have been replaced by Willie Behan by that time. Gary Moore and Noel Bridgeman of Skid Row also subbed on occasion. They appeared on RTE's "Like Now" TV show performing "Land of 1000 Dances". Video of this performance is presumed lost. The band showed lots of promise and there was record company interest but one way or another it came to nothing. 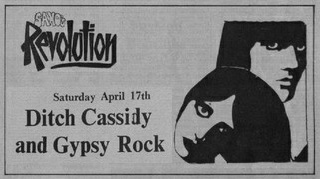 A showcase gig in London in March 1969 was sabotaged by drugs, an unfortunate own goal. The News played regularly in Germany thanks to Ditch's contacts from the King Bees days. In fact they spent lengthy stretches of 1969 playing the German clubs and eventually based themselves there and changed their name to Chillum. They had begun to incorporate Hendrix and Iron Butterfly influences in their sound. Bizarrely, Cassidy & Boylan were arrested in at the French-German border when returning to their base in Germany following a holiday in Nice at the beginning of December 1969. They received an extraordinarily hostile reception and were treated very badly by the police. They were released after nine(!) days in custody and returned to Ireland penniless and presumably shaken by the experience. Unsurprisingly the Irish press turned the story into a scandal, casting the duo as the villians of the piece. As a result the band was shunned by many promoters. Brian Harris joined The Gentry. Ditch launched a new band in 1970 called White Magic whose lineup included Frank Boylan on bass. White Magic appeared on the bill of the Progressive Music Concert held at St. Aidan's Hall, Dublin on 14 July 1970 alongside Granny's Intentions, Blueshouse, The Urge, Macbeth, Switch, Thin Lizzie, and The Few. 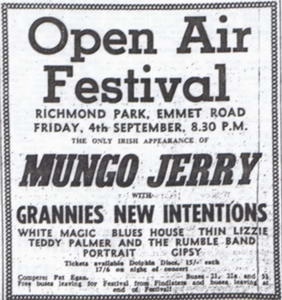 They also appeared at the Open Air Festival held two months later at Richmond Park on 4 September 1970 with Mungo Jerry, Granny's Intentions, Blueshouse, Thin Lizzie, Teddie Palmer & Rumble Band, Portrait and Gipsy. Frank Boylan joined Mellow Candle in 1971. In November 1970 a showcase gig was organisied for Decca Records in Zhivago's in Dublin. Ditch was backed by Thin Lizzy. The gig turned out to be a disaster for Ditch, but Frank Rogers was impressed by the band and arranged a separate audition for Lizzy which led to Decca signing the band. 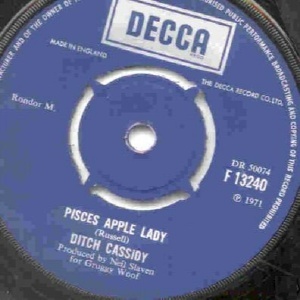 Ditch Cassidy finally signed a lucratrive solo deal with Decca in 1971. 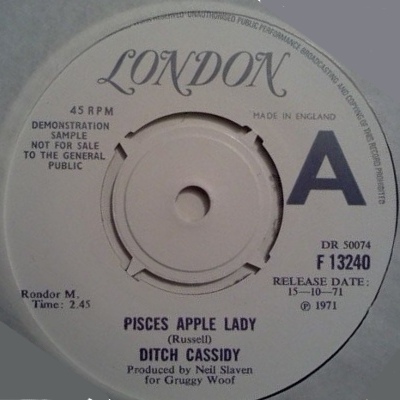 He recorded an album's worth of material for the label but for some reason only one single emerged, in October 1971, with a cover of Leon Russel's "Pisces Apple Lady" on the A-side and an excellent track on the B-side. Jimmy Page (Led Zeppelin) is reputed to play on this single and it is a tough one to find. Which musicians from Ditch's backing bands played on these recordings is unknown to me. 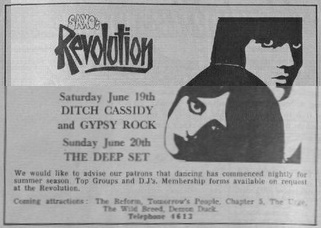 Ditch Cassidy meanwhile formed Gypsy Rock in early 1971 (not to be confused with Gipsy). The lineup included Victor and Henry McCullough, Henry somewhere between his time with the Grease Band and Wings. The band lived in a house in Portrane, Co.Dublin (thanks to Fran Butterly for providing this info). They supported Thin Lizzy on their final Dublin appearance before relocating to London on March 16th. Ditch's next band was supergroup Freak Show (1971). More details to follow.